Okay, so the first step is to go buy My Backup Pro from the Play Store on one of your devices. 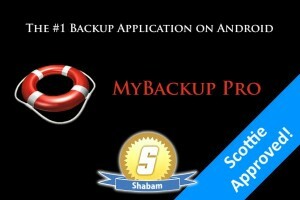 It’s $4.99 on the Play Store, or you can buy My Backup Pro from the Amazon App Store for $2.99 . In either case, then go to the other device, and install it on that phone/tablet as well. With the Play Store at least, you only have to pay for it once, but you can install it on multiple devices if you use the same Google account on all gizmos. 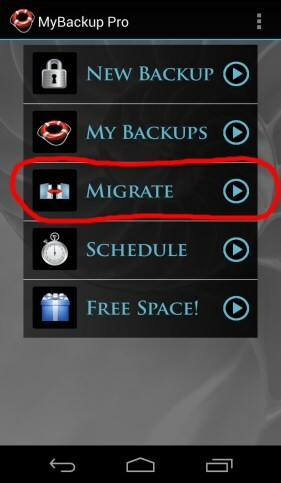 There is a free version of My Backup Pro, but it doesn’t have the Migrate feature we’ll be using. So, bite the bullet, pay $4.99, and be happy. The next step is to connect both devices to the same WiFi network. 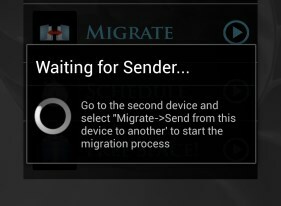 This is necessary for the Migrate option to work properly. You’ll have to decide what Data to copy over to your new gizmo. 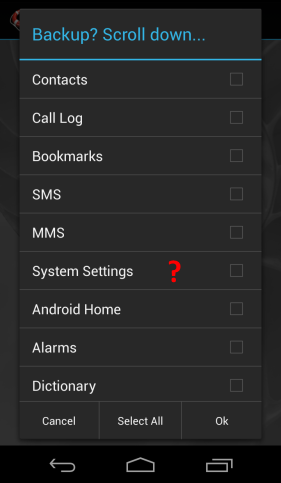 Usually, I do not pick System Settings. Sometimes this should work okay, and sometimes maybe not. For example, you might be copying Data from an old phone with an older Android version to a new gizmo with a more modern version of Android. So, you may wish to skip copying the System Settings. It’s not too hard to set that stuff up again on your new device, anyway. There will be some potential prompts along the way, but don’t worry – My Backup Pro has excellent menus with explanations that walk you through each step. 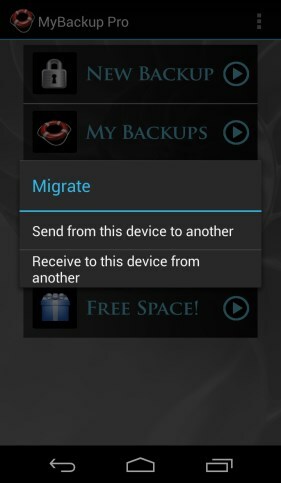 As an example, if you decide to transfer your SMS texts from your old device to your new one, My Backup Pro temporarily has to “take over” as the primary SMS app. It does this for you automagically, and walks you through the process. It’s really, really easy to use. One you’ve transferred all the Data, My Backup Pro will probably prompt you to restart your new device. Don’t do that just yet. 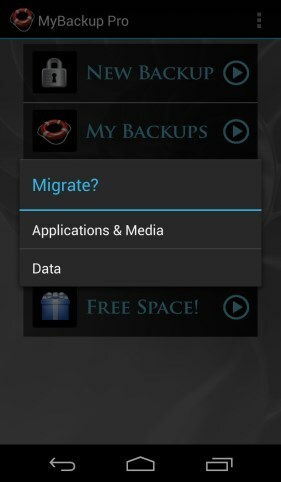 Start another Migrate, and this time choose Applications & Media. This time around, you’ll select what apps and media (Photos, Video, etc.) you want to copy over. When it transfers Apps over, My Backup Pro will ask you what to transfer. Choose APK + Data. It will probably also ask you to set the “Install from 3rd-party sources” option in the Settings menu, and ask you to confirm each App install. As I said, don’t worry – it will walk you through the whole process with on-screen messages. When all of your apps are transferred over, reboot your new device. I’ve never tested the online backup features, because I don’t see the point. I just make local backup files on the device itself, and then stash them away locally by copying the backup ZIP files over a USB connection to my puter. All in all, My Backup Pro is one of the easiest ways to backup and restore your Android devices’ content, and well worth the price! ← Capture Part of your Screen in Windows: Behold the Snipping Tool! I just download and followed all above instructions to completely copy one TV Android box to another and it did not work. I got all the screens shown in your instructions and everything ended correctly but nothing changed on the receiver box. It still has the same old main menu and I had to go through several hours of re-installing all the app’s I thought the app you recommended would copy everything so the receiver box would boot up with the same main menu and app’s installed and running. Did I miss something here? By the way the My Backup Pro costs $7 not $4.99. Thanks for your response. Somethings like app’s migrated but had to be re-installed but none of the main menu or system stuff migrated. I am trying to transfer the main menu system from a Skystream x4 TV box I own to a much cheaper MXQ Pro TV box so they will look the same. At this point I don’t know if the main menu is hard wired or not. I would think the Google play store would only carry the most updated versions of app’s. The main menu and system stuff probably wouldn’t be migrated. I’m guessing that’s customized somehow, although I’ve never done a transfer with “System settings” enabled in MyBackupPro, so I’m not even sure what that copies over.